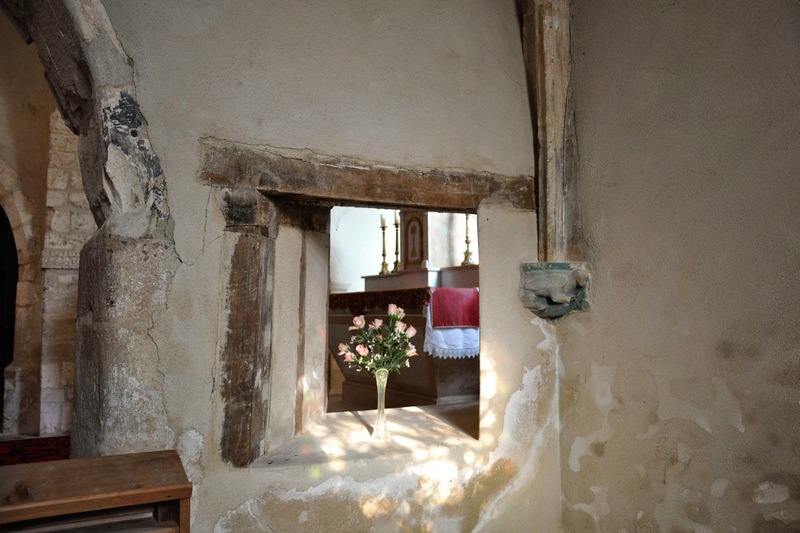 The church in Jambles has a separate chapel for the Seigneur (Lord of the manor), and that chapel is separated from the space for the altar by a wall. 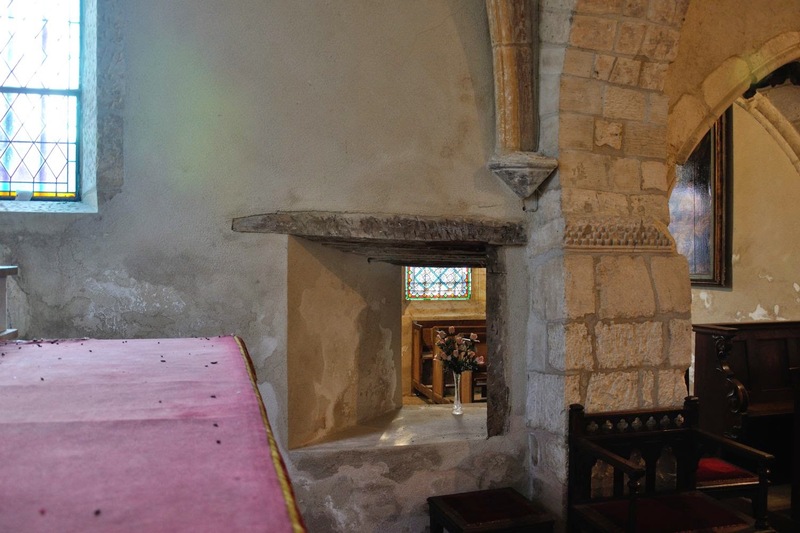 In that wall an opening has been made, not perpendicular to the wall, but at an angle, in such a way that one can see the altar from the chapel, but the church goers cannot see what is going on in the chapel. That way the Lord of the manor can watch the show at the altar without being seen by the bourgois. QED: “Observing without being seen”. 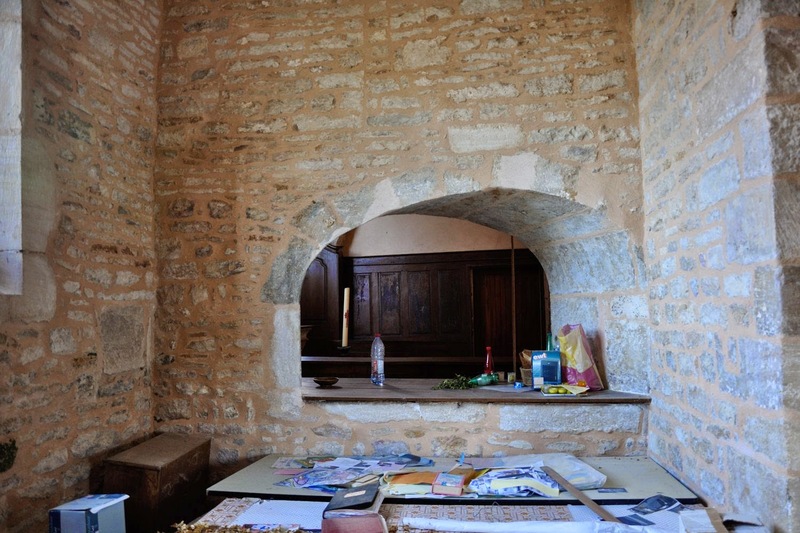 I had seen similar holes in chapel walls (amongst others in Cruzille, at least something that strongly resembled this one), without knowing why it was there. Well, at least I know now! The world is bigger than just Burgundy! 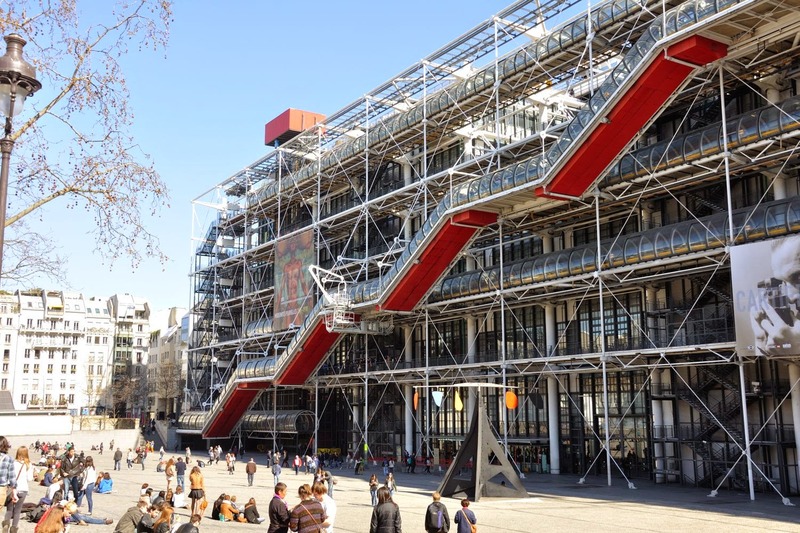 Some people are not very broadminded when it comes to their judgement of architecture, music, art, etc. In itself there is not much wrong with that stand point; it only becomes a bit of a menace when people try to inflict their taste on others. Interesting in its own right! I hope I am not so narrow minded when it comes to appreciating art. A good way to check that statement presented itself when I started digitalising my old slides. Over the years I had built up a collection of a good 10600 of those now almost obsolete pictures, taken in Europe, Asia and North-America. 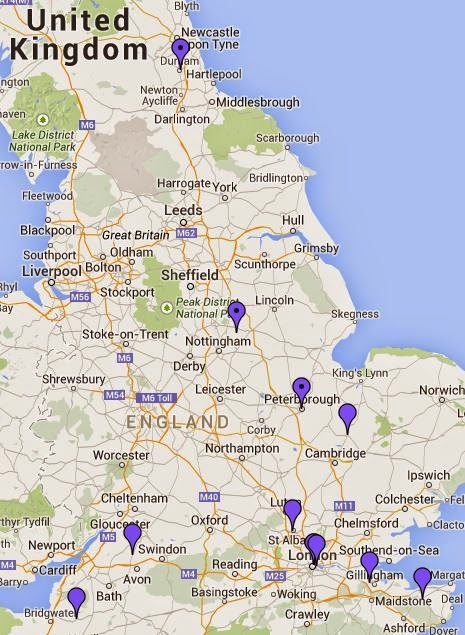 Whilst scanning however, I came across a far bigger number of Romanesque churches than I remembered having ever seen. 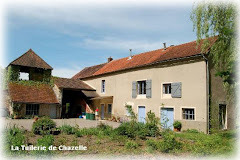 And since it is nicer to share something than to keep it for oneself, I send a list of all my slides to the creator of "Bourgogne Romane”,who turned out to be interested in a number of my old slides. 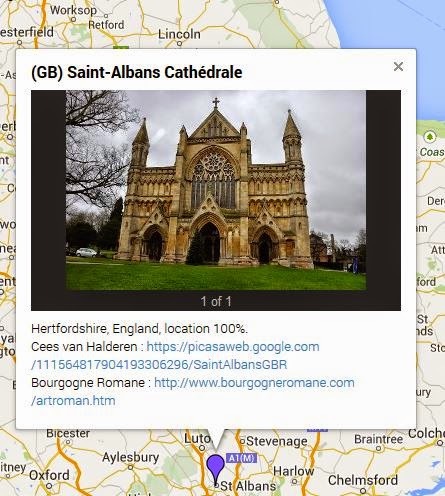 And again several of my pictures appeared on the webpage “L'Europe Romane”, a collection of more or less randomly chosen churches for which pictures were available. And since I am really keen on knowing where to find something (be it a town or a building) I decided to create still another map. In the mean time this map, which started off as just another thing to keep myself busy, has grown more than I thought it would. And even though there are still buildings being added, the map is roughly ready for use. And of course that requires a concise instruction for use. Well, here we go! 1. The pins have the same colour per country , hence lightblue is France, purple is Great Britain, etc. 3. Each entry (hence each church or building) has at least one picture (the baptistère in Firenze e.g. 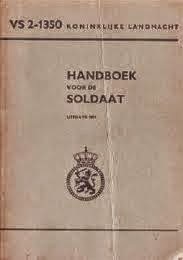 has 3 pictures attached), in most cases copied from van Boxtels website, where possible however taken from my own stock in various Picasa Albums. If the latter is the case a link to the appropriate album is included. Also the accuracy of the location on the map is given : 100% is spot on, 50% means in the right town, but exact location unknown to me. 4. 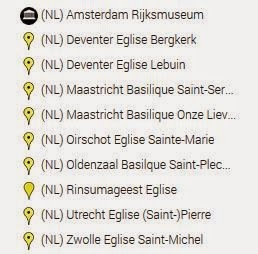 On the maps I have used pins with a black spot for churches of which only van Boxtel possessed pictures, and pins without a black dot for buildings we both had pictures of. 5. 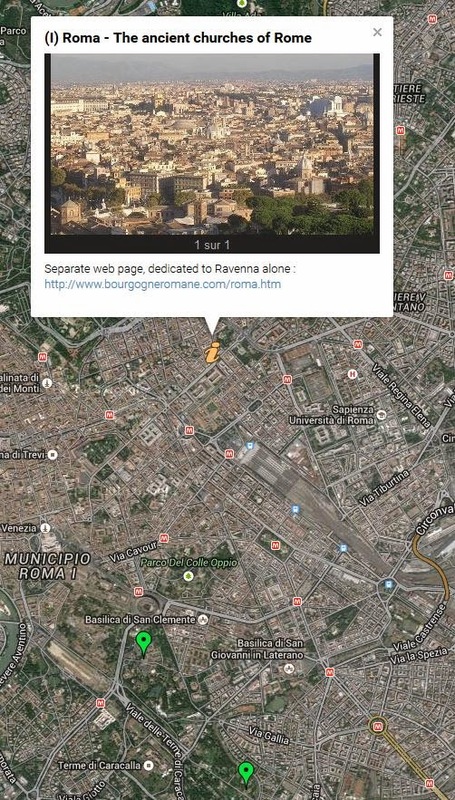 To more or less complete the references to "Bourgogne Romane" a link has been provided to van Boxtel's separate pages "The ancient churches of Rome", "Pisan Romanesque Art" and "The ancient churches of Ravenna". 6. In the centre of the 4 departments that make up the region of Burgundy the coat of arms of each deparrtment is displayed with reference to the detailed page of Bourgogne Romane and my detailed map of that department. 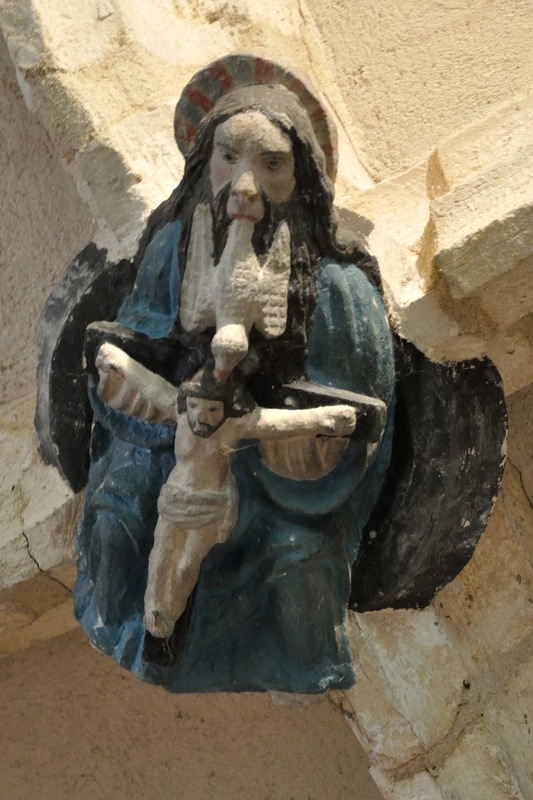 During our many visits to Romanesque churches I usually pay a lot of attention to the architectural details (columns, capitals, arches), but relatively little to religious paraphernalia in that church (altars, baptismal fonts, statues of saints). 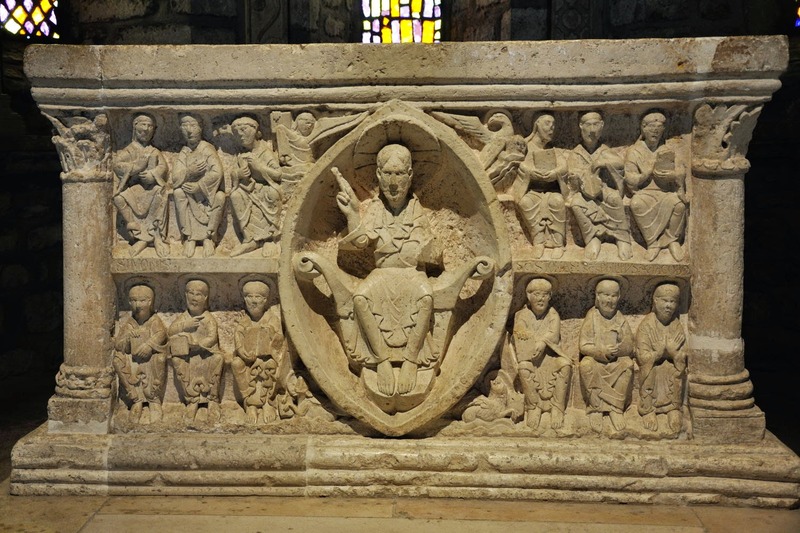 Of course there are some exceptions, such as churches with an extremely beautiful altar (e.g. 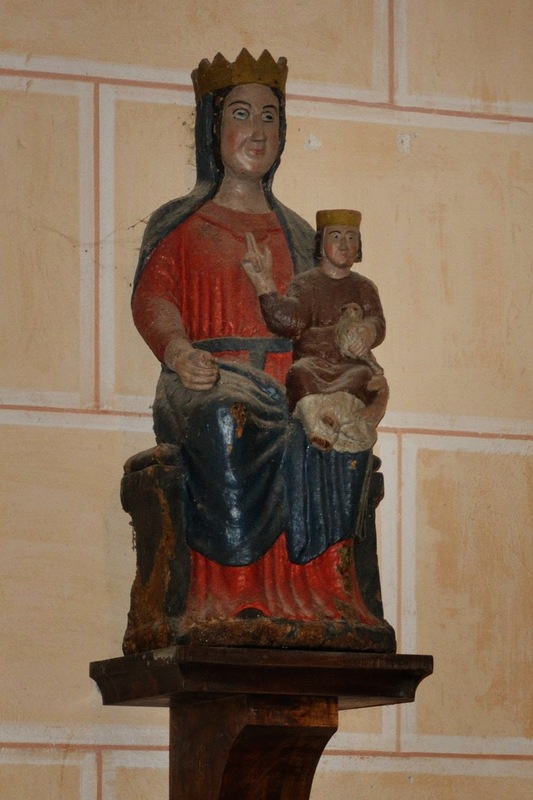 in Avenas, 69) or with a statue of a saint which is dating back a thousand years or so (such as in Saint-Huruge, 71). However, it pays off to keep your eyes open also when the paraphernalia are not that old. And I am not referring to the aesthetic value of some statues, but to deviations from the “norm”. I had never realised that there was such a norm where statues of saints are involved, but thinking about it it seems logical. Church goers were, certainly in a distant past, illiterate, and no matter how often you scribble St-Peter under a statue, the fact that this guy carries one or more keys identifies him better than words could do. 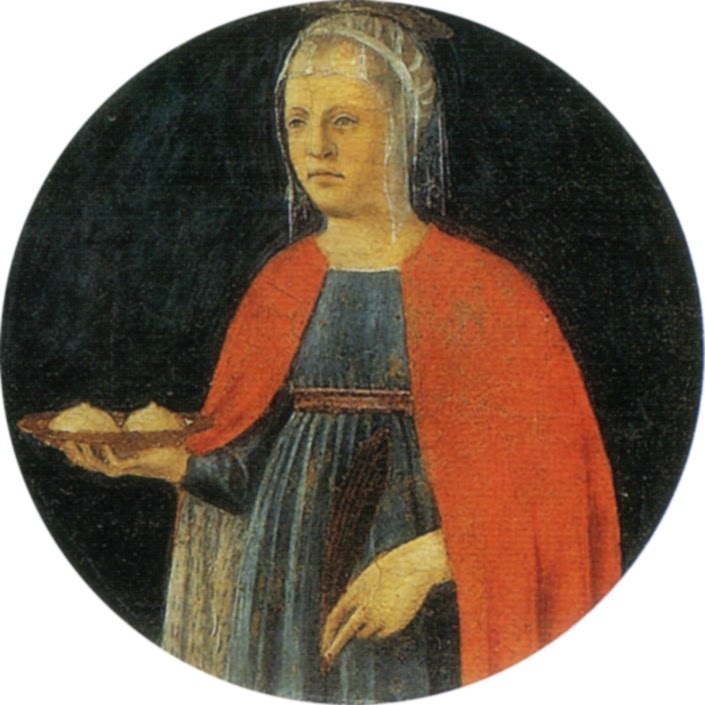 Hence each saint has his or her own protocol: Saint-James the Greater always carries some pilgrim’s scallops with him, Saint-Denis of Paris walks around with his head in his hands, Saint-Agatha carries her cut-off breasts around on a platter at the same time holding an olive branch, Saint-Fiacre has a spade in his hands, etc. Every saint has his own image, and whether you order a statue from Paris, Lyon or Marseille, it will always look roughly the same. But not each statue comes from a factory. Some are produced by the local sculptor, wood cutter or artisan, and they can allow themselves some poetic licences. 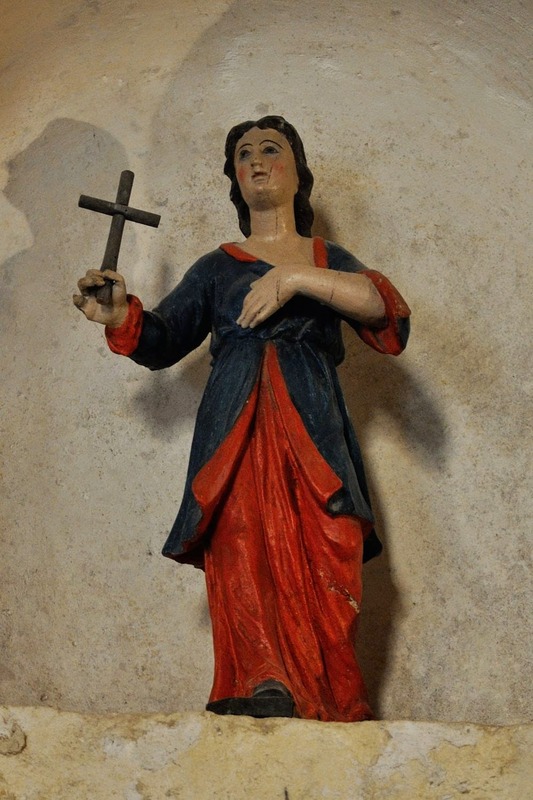 In the church in Jambles we encountered a statue of Saint-Agatha, still in the possession of both her breasts and carrying a cross instead of an olive branch. In the same church we found a rather plastic depiction of the Holy Trinity….